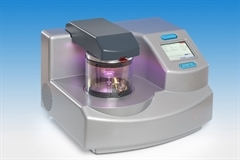 The Q150T is available in three formats: sputtering, carbon evaporation or both. Depending upon the selected configuration, the Q150T can be a top-of-the-range sputter coater for high resolution scanning electron microscopy (SEM), a carbon coater suitable for SEM and transmission electron microscopy (TEM), or both - in a single easy-to-use system. Other options include metal evaporation and aperture cleaning. The Q150T is available in three formats: sputtering, carbon evaporation or both. 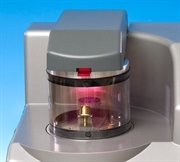 Depending upon the selected configuration, the Q150T can be a top-of-the-range sputter coater for high resolution scanning electron microscopy (SEM), a carbon coater suitable for SEM and transmission electron microscopy (TEM), or both in a single easy-to-use system. The ability of the Q150T to sputter a wide selection of oxidising and non-oxidising metals also makes it an ideal platform for many thin film applications. Metal evaporation and aperture cleaning insert options are available. The Q150T is presented in a custom-moulded, one-piece case - allowing easy servicing access. The colour touch screen allows multiple users to input and store coating ‘recipes’. The case houses all the working components, including the efficient 70 L/s air-cooled turbomolecular pump. Automatic bleed control ensures optimum vacuum conditions during sputtering. The vacuum chamber has an internal diameter of 165 mm/6” and comes with an integral implosion guard. 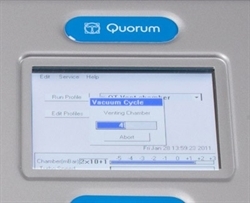 The Q150T also includes ‘vacuum shutdown’, which enhances vacuum performance by allowing the chamber vacuum to be maintained when the system is not in use. 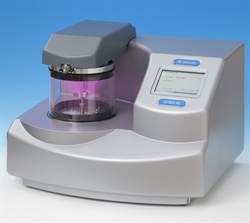 A variable speed rotary specimen stage is fitted as standard, with other stages available as options. • Q150T S - a high resolution sputter coater for oxidising and non- oxidising (noble) metals. A wide selection of sputtering targets is available, including iridium (Ir) and chromium (Cr) which are highly recommended for FE-SEM applications. • Q150T E - a high vacuum carbon coater, ideal for the production of highly stable carbon films and surface replicas for transmission electron microscopy (TEM). The system uses economical, high purity 3.05 mm Ø carbon rods. • Q150T ES - a combined system with both sputtering and carbon coating. The deposition heads can be swapped in seconds and the intelligent system logic automatically recognises which head is in place and displays the appropriate operating settings. Each of the above can be fitted with a range of optional accessories (metal evaporation, carbon fibre evaporation coating, film thickness monitor, etc.). At the operational heart of the Q150T is a simple colour touch screen which allows even the most inexperienced or occasional operator to rapidly enter and store their own process data. For convenience a number of typical sputtering and evaporation profiles are already stored. Installed as standard on E and ES models, this profile ensures that carbon is evaporated in controlled short pulses. This significantly reduces the amount debris (large carbon fragments) associated with traditional carbon "flash" evaporation. Also it allows the carbon cord evaporation process to be accurately controlled using the optional film thickness monitor (FTM) accessory. This has two important benefits. Careful control of evaporation allows precise control of carbon thickness (with or without the optional film thickness monitor). In addition the quality of the resulting carbon films is enhanced by the eradication of "sparking" that is a common feature of less advanced coating systems. Aluminium (Al) can be more difficult to coat due to its fast oxidising properties. Oxide layers can be difficult to remove, but the Q150T ES and Q150T S include special on-board profiles for aluminium (Al) that reduce the oxide removal time and prevent excessive pre-sputtering of the already clean target. A suitable rotary vacuum pump is required. The Pfeiffer DUO 6 5 m3/hr two-stage rotary vacuum pump is ideal for this purpose. Dry pumping alternatives are also available.